Authors of new book The Cowkeeper's Wish on their writing process, and the books that inspired them along the way. The Cowkeeper’s Wish chronicles our English family, beginning in the 1840s in London, England, and finishing up in London, Ontario, in the 1930s, when our grandparents married. The story is divided into three parts—the Victorian years, set in some of London’s poorest neighbourhoods; the First World War; and the post-war period, when our 10-year-old grandmother came to Canada in the care of a family friend. A story that covers so much ground requires an exhausting amount of research. It took us nine years to complete, with a few breaks here and there to rejuvenate with other projects, and while at times it seemed we would never finish, the work never felt boring. Learning about all these periods, and our family’s place in a larger history, was fascinating. We read widely to understand everything from workhouse life to the suffragette movement to social reform. Now, knowing as much as we do about our family’s path, we find connections with many other stories, though told in different ways. Here’s a list of books that we find inspiring. Timothy Findley’s The Wars was probably the first book I ever read about WW1. It was years ago now, but I still think of it often. The devastation war brought for human beings is prevalent throughout, but the suffering of animals, and especially of horses, made the book both difficult and necessary to read. Findley’s character, Robert Ross, is 19 when he enlists, about the age of our great uncle Joe, a young and inexperienced sailor on board a destroyer that was sunk in the North Sea with nearly all of its crew in 1917. The Frozen Thames is a slim book that spans an astonishing seven centuries. 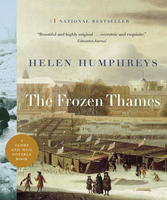 I have tremendous admiration for Humphreys’ vignettes, spare and beautiful, and for the originality of the book itself, based on the forty times the River Thames has frozen over. The book is gorgeously illustrated with images that pull us backwards in time, ending with the great frost of 1895. That was the same year our great grandparents married in a church just steps from the river. Much of our story is set here, so close to the Thames, in the poor borough where our family lived from the 1840s on. Deafening begins in the early 1900s in Desoronto, with a deaf girl finding her place in the world. By the time war erupts, she’s a young married woman, whose husband goes overseas as a stretcher bearer. This book—about love and loss, listening and silence—captured me from the very beginning. I was also taken with Tell, a sequel written more than a decade later, which explores the difficult period after the war, when people returned changed from their experience, both physically and emotionally, and had to figure out how to pick up their lives again. WW1 takes up the full middle of our story, which is divided into three parts. We did lots of facts-and-figures research to put the story in historical context, but we wanted more than anything to convey the profound effect the war had on ordinary people. I often thought of my great-grandmother while working on this part of the book. She’d lost her husband before the conflict began and saw her teenage son off to war. It’s impossible for me to truly imagine how it felt to live through those times, and how to cope with such monumental losses. I loved Margaret MacMillan’s Paris 1919. I picked it up in an attempt to understand the broader impacts of WW1, and was gripped by the squabbles and negotiations that went on between countries. MacMillan is the great-granddaughter of one of the many characters she explores, Britain’s WW1 prime minister, David Lloyd George. Our own history is far less illustrious, but in that same year my grandmother emigrated from England to Canada, her life, like so many, forever changed because of war. By Gaslight is a big, beautiful book with a compelling and satisfying story between its covers. In the midst of writing and researching The Cowkeeper's Wish, set, in part, in the same Jack the Ripper era, this "persuasive pea-souper" was the perfect tale to keep me connected to my own story while escaping into another. The Outlander is a fast-paced, bold adventure set in the wild of the Canadian Rockies in 1903. Its heroine is a teenage fugitive, a "widow by her own hand," chased by her gun-toting in-laws and a pack of bloodhounds. I loved it! Like By Gaslight, it was escapism for me, while still keeping me anchored in the time I was writing about. Poignant, gentle and sad, this story of a man returning to his hometown after his mother's death spans three generations. I've always wanted to write a book like this, telling the story of several generations at once through flashbacks and memory and stitching everything together with the one common thread of family. This novel had relevance for me while I worked on The Cowkeeper's Wish because of the way it portrayed the difficult, complicated and mostly repugnant relationship between a Victorian aristocrat, Lady Duff Gordon, and her servant. It helped me to at least begin to grasp the Victorian perspective and the class consciousness so prevalent in the times. Considered by many as a modern classic, Cumyn's portrayal of the experiences of a Canadian private in World War I is surprisingly intimate and beautiful. His descriptions of trench warfare and life at the front coupled with his depiction of a soldier's sense of duty and horror of combat helped shape my understanding of the emotional journey a soldier might have taken in WW1, a time we would write about in The Cowkeeper's Wish. In the 1840s, a young cowkeeper and his wife arrive in London, England, having walked from coastal Wales with their cattle. They hope to escape poverty, but instead they plunge deeper into it, and the family, ensconced in one of London’s “black holes,” remains mired there for generations. The Cowkeeper’s Wish follows the couple’s descendants in and out of slum housing, bleak workhouses and insane asylums, through tragic deaths, marital strife and war. Nearly a hundred years later, their great-granddaughter finds herself in an altogether different London, in southern Ontario. 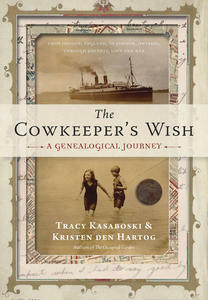 In The Cowkeeper’s Wish, Kristen den Hartog and Tracy Kasaboski trace their ancestors’ path to Canada, using a single family’s saga to give meaningful context to a fascinating period in history—Victorian and then Edwardian England, the First World War and the Depression. Beginning with little more than enthusiasm, a collection of yellowed photographs and a family tree, the sisters scoured archives and old newspapers, tracked down streets, pubs and factories that no longer exist, and searched out secrets buried in crumbling ledgers, building on the fragments that remained of family tales. While this family story is distinct, it is also typical, and so all the more worth telling. As a working-class chronicle stitched into history, The Cowkeeper’s Wish offers a vibrant, absorbing look at the past that will captivate genealogy enthusiasts and readers of history alike.